Well, here we are. July 31. Those of you who RSS this blog may get this final, desperate pitch in time to act. For the rest of you, this posting represents a somber coda for this journey of book pimpage we've all endured - er, enjoyed. Today, sales for the collectable signed, limited edition hardcover of my story collection Monstrous Affections ends at Horror Mall. If you are very quick with a mouse, modem and paypal account, you may still be able to order it by clicking here. After today, the collectable edition of this collection becomes, well, collectable. But if you read this post on, say, August 1 (or later today when Horror Mall knocks down the link) don't despair. Attendees at Worldcon next weekend can pick up a much less collectable and much more affordable trade paperback at the ChiZine launch (or at their booth in the dealers' room for that matter). And later in the year (much later) Canadian readers at least will be able to pick it up in bookstores, as I am reliably informed by the publisher that it has already been pre-ordered by some. So there you are. One pimping spree ends, another begins. It's the cycle of publishing. Related Links: Monstrous Affections Pimpage Page , Information on the ChiZine Launch @ Worldcon, Peter Watts Likes Monstrous Affections, My Interview With Claude. Time does fly, when you're procrastinating about buying a limited edition of my story collection Monstrous Affections. Here we are, at about the end of July -- two months after the collector's hardcover went live at The Horror Mall. Soon, it will be live no longer, and the opportunity to purchase said hardcover will be gone. Forever. Feeling the intense pressure yet? If you cannot stand it anymore, click here and order up a book. It'll show up later this year, signed by me, high-end cover-artist Erik Mohr and Michael Rowe, who wrote the introduction. If it turns out you don't have the coin set aside for the $50 edition, though, don't despair. Soon you'll be able to pre-order a handsome trade paperback edition for under $20 from the same folks. Even sooner, if you're attending Worldcon in a week, you'll be able to pick up one of those trade paperbacks at the ChiZine launch (see the post immediately below). It will have everything but the binding and the signatures. If you're curious about what 'everything' entails, by all means check out the sampler currently up at The Devil's Exercise Yard. Hello, landlubbers. I am writing this from a room at the Gibraltar Point Centre for the Arts, on the Toronto Islands, currently quarantined by a long-running municipal workers' strike that has stopped the ferries from running. The Islands, for those of you not from around here, are a Village-like setting on city parkland just off the coast of Toronto. Gibraltar Point is the site of a former lighthouse (reputed to be haunted) opposite which there is a former school, that has been transformed into an artist's retreat. I am stranded here with a bunch of artists, and a bunch of sf writers, for a week of writing. Scroll down, and there are pictures. But first, a bit of business. There are about 11 days left during which you might purchase Monstrous Affections, my story collection, in its limited-edition, somewhat-more-costly-than-you-might-be-used-to glory. After that, a much less expensive trade paperback will be available from ChiZine, and much afterwards, you might possibly find it in fine bookstores across the nation. So if you want a beautiful signed edition that's cloth bound and don't mind paying for it, now's the time to order. Go here. 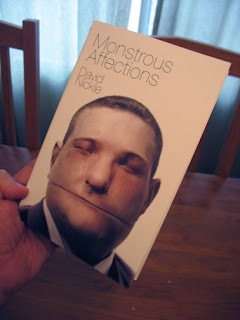 You can also, if you're at Worldcon in Montreal, pick up that less expensive trade paperback Monstrous Affection at the ChiZine Publications launch. It's a special, Worldcon-only offer. More info here. And now... The desert Island. I got off the phone with her son Leo - and that was one thing he was very clear about: don't say Phyllis passed away, or passed on. She wouldn't have tolerated that kind of imprecise, beating-'round-the-bush talk about something as straightforward as death. So Phyllis died, at 83, at Mt. Sinai Hospital in Toronto after what had been a successful surgery to deal with a burst appendix. Phyllis was a friend and a colleague, and in an important way, an ancestor. She was a science fiction writer who managed a 50-year career selling stories of space travel and aliens and mutant children from her hometown - something that was until the past couple of decades very unusual, to the point you might call her a pioneer. Or, if you do this kind of thing yourself, an ancestor. Her first novel, Sunburst, was honored by the naming of the Sunburst Award. She wrote many more - the last of which was published in Rob Sawyer's imprint just two years ago. She was also a poet of some reknown. I work as a reporter for a chain of Toronto community newspapers. So when I heard about Phyllis' passing, I called my editor and told him I'd like to write an obituary in her local paper. And that's what I spent part of today doing. I got in touch with Leo, and also with Calvin, Phyllis' husband of 60 years. I will be honest and say I knew the two of them only a little. But when I saw them together, at conventions or get-togethers such as we in this community have, I was always moved by the love and care they took with one another. Calvin told me, "she was the love of my life," and I believe that he was the love of hers. It was a pretty tight deadline. I couldn't get as much into the story as I'd have liked. I'd hoped to have gotten a comment in from Rob Sawyer, her last editor, but he was out of town and didn't get my email until the deadline was past. He sent me some quotes anyway, to redact any way I wished. They got redacted right out of the story. Phyllis Gotlieb was the mother of Canadian science fiction, and a great inspiration to me. She was a founding member of the Science Fiction and Fantasy Writers of America -- the only Canadian in that group when it started in 1965. She was proof of concept that you could live in Toronto and still be a science-fiction writer for major American publishing houses; if I hadn't had her as a role model, I'm not sure I ever would have embarked on the career path I took. We'd been friends for 30 years -- I met her in 1979 when my high-school science-fiction club had her as guest of honour at a little convention we put on at Northview Heights Secondary School. She was feisty and opinionated and passionate then, and she was still all those things the last time I saw her, not that long ago. One of my greatest professional thrills was getting to publish her final novel, Birthstones, in 2007, under my Robert J. Sawyer Books imprint for Markham's Fitzhenry & Whiteside. Phyllis Gotlieb. I would say 'rest in peace.' But that might be too fussy for her taste as well. So I'll just say it simple: she's missed. ... I came home with a notably heel-spur free heel, tried a run, and did a good 10K around the portlands, laughing like a mountain man all the way. There's no objective evidence, but I'll still credit Polaris and the very attentive and helpful crew of volunteers that brought the whole thing off. That's right - I'll be at Polaris this weekend. Polaris being the CRT-and-LCD-focussed media sf convention where we talk about television and the movies and a bit of the fiction. I have panels, and a reading, and a signing, in my home-town of Richmond Hill this time. It is at the Sheraton Parkway Toronto North Hotel, at Highway 7 and Highway 404. And I have a pretty packed schedule (particularly Saturday evening). Description: Harlan Ellison wrote a story in which a professional writer tries to turn submitted ideas into awesome. It nearly drives him mad and only stopping an alien invasion keeps him from losing it. Anyway we're doing it with our professional panel to see if it drives them mad. I mean if it's fun/helpful. Description: Who watches the Watchmen? Now that you've actually seen the film, what do you think of the giant squid at the end? Me. Reading a story. I'm thinking "The Sloan Men." Description: "Dolls" can be anyone. Their personalities wiped clean, each doll is a clean slate. This leaves the doll the ability to have new personae imprinted on them once they're hired out. But once they return to the dollhouse, their minds are wiped and they return to a childlike state. What is the mystery shrouding the Dollhouse, and its shady ways? Description: 2009 marks the 200th anniversary of the birth of horror master Edgar Allan Poe. Roger Corman directed several films based on the Poe's work, and it can be said that Poe would not be nearly the horror figure he is today without Vincent Price mugging his way through The Fall Of The House Of Usher and The Pit And The Pendulum, or old drunk Peter Lorre whooping it up in The Black Cat and The Raven. Celebrate Poe's birthday by reflecting on Corman's adaptations. Which were the most faithful, and which left you wondering... dude, where's my raven? Description: God Hates Fangs. At least in the south, he does. Sooki discovers that fang bangers have all the fun, until everyone she knows starts to die on her. Join us for a general discussion of this fangtastic show. (And more puns on the word "fang"). Description: Let's face it, Canada has great writers who are producing amazing books. What? You aren't sure? Then come to this panel and get your head re-threaded right and discover all that Canada has to offer, bookwise.